During the blogger meet up at the Trina Turk Boutique in Burlingame a few weeks ago, I ended up picking up the Trina Turk Accomplice Top. To be honest, the top did not look like much on the hanger, and I probably wouldn’t have tried it on if the lovely salesperson Betsy didn’t suggest it. I loved the top the minute I put it on. It is very comfortable, and I love the fit. It’s roomy but not boxy, which I had feared it would be from just looking at it on the hanger. I guess I am used to tunic-length tops, and a shorter top looked very different. But instead of being boxy, the top drapes nicely. I paired the top with comfortable, ancient, roomy jeans and a basic black blazer from Zara and loved how effortlessly the outfit came together. I actually wasn’t feeling very well on the day I was wearing this outfit, and I was very comfortable yet presentable. I guess the lesson learned here is that you can’t judge a garment from what it looks like on the hanger. I probably should try on a lot more clothes! Also, a good salesperson can really steer you in the right direction. Thanks, Betsy and Trina Turk Burlingame for helping me find a great addition to my wardrobe! I know that I’ll get lots and lots of wear out of this top and am already planning several outfits that include the top. 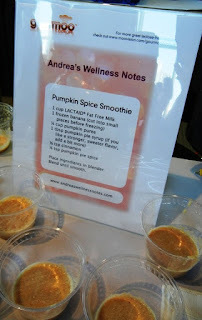 I started Andrea’s Wellness Notes seven years ago, on March 14, 2009. When I started my blog, I was pretty frazzled with a toddler, a teenager, and a demanding job. Plus, I was quickly approaching 40. I wanted to refocus on myself and on living my best possible life. Initially my focus was mainly on healthy living - food, exercise, and other things that brought me joy. Not too long after starting my blog, I met some fabulous people through blogging. Most of the connections happened online, but some bloggers I got to meet in real life. And I was able to attend some pretty awesome blogger conferences. The connections I made with others are what kept me blogging. Andy also started a blog in 2009 and initially focused on food (in 2011 he switched his focus and has been chronicling the craft beer scene in the South Bay ever since), so we got to attend two FoodBuzz Festivals in San Francisco together (2010 Part 1, 2010 Part 2, 2011 Part 1, 2011 Part 2). 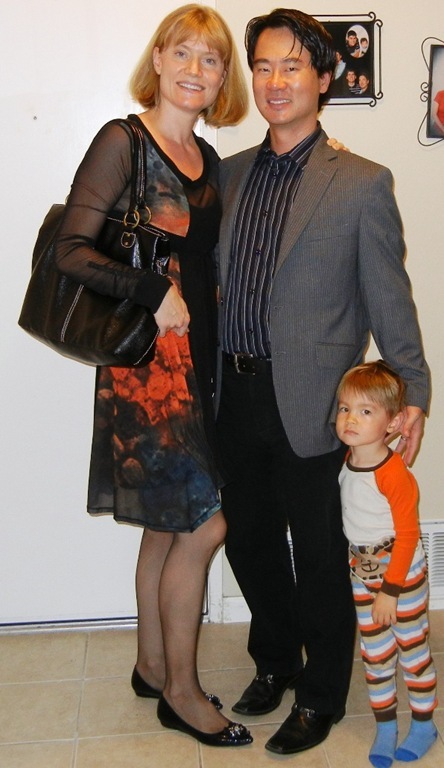 It was a fun way to sneak away on a date… We even got to dress up for a fancy dinner in the Ferry Building. Hard to believe the kid was that small once… And my recipe for a Pumpkin Spice Smoothie got second place in a recipe contest at the festival! While I love blogging, there have been times when I thought about quitting. But then I remembered all the fabulous people I have connected with through blogging. I believe the real magic of blogging is connecting - and staying connected - with people you meet through your blog. Most of the bloggers who started when I did (and there was a group of us that all started at the same time and got to know each other pretty well) are not blogging anymore today. Two of those who have quit (or have for the most part quit) have become very good friends of mine. Biz from My Bizzy Kitchen is one of the few who is still blogging today. Her blog was one of the first food blogs I found, and I still read her blog every week for some humor, awesome recipes, and to keep up with her life. She recently quit her job, and is carving out her place in the food world, and I’m very excited for her. I’ve known Biz for almost seven years now and feel a real connection to her, even though we have never met in real life. Last year I had to take a blogging break for a few months (the first time I didn’t blog at all for more than a few weeks), and when I came back to blogging, my focus shifted more to style as I realized that style is an important part of self-care and that’s where my current passion lies. Since becoming part of the style blogging community, I have connected with some awesome bloggers online. And on Saturday, I got to meet some of them in person. They were just as nice in person as online. We all met thanks to Kim from Northern California Style who hosted an event at the Trina Turk Boutique in Burlingame. Dawn Lucy from Fashion Should Be Fun and April from Ms B in the Bay Area were also there. I very much like each blogger’s individual style and enjoy the local connections in their posts once in a while. It was wonderful to meet them in person! Dawn Lucy from Fashion Should Be Fun, Me, Kim from Northern California Style, and April from Ms. B in the Bay Area - Thanks for the photo Kim! We chatted, had a drink and some snacks, tried on clothes, and I ended up taking a few pieces home. Here are some not-so-good dressing room photos of some of the clothes I tried on. I’ll share what I ended up buying soon. In the meantime, Dawn Lucy already posted about the meetup on her blog. Check out her post, showcasing some of the pieces she tried on. I love her in the orange jumpsuit! She looks stunning! And if you are not familiar with her blog, check it out. She has an amazing sense of style and has a lot of fun with fashion - I guess hence her blog title! And here are some of my Trina Turk favorites. Such a great line! I look forward to meeting up with these fabulous ladies (and a few others who couldn’t make it) again. Thanks Kim for hosting such a great event! And thanks to the fabulous ladies at the Trina Turk Boutique in Burlingame. They were so friendly and helpful; I look forward to going back! Questions: If you are a blogger, why did you start your blog? If you are a blog reader, why do you read blogs? Have you ever thought about starting your own blog? If so, what’s stopping you? If you are a blogger, why are you continuing to blog? Have you met any bloggers in real life?